Book Review of "On A Trail With Ants"
If you need any specimens for your research please contact to place your request antbase.net! Order your Copy of "On A Trail With Ants"
in our attempt to introduce different projects dealing with ants and to create a forum for presenting new projects and for discussion, we present a review of the book "On a trail with Ants" by Ajay Narendra and Sunil Kumar M.
The book “On a trail with Ants” comes with a high demand: to fill the gap to the last comprehensive publication on Indian Ants from Bingham, now more than a century ago, and the rapid advancements in entomologic research. In short, this demand is truly fulfilled. “On a trail with Ants” is a wonderful book about the ants of peninsular India. It combines almost 200 marvelous pictures of ants and their behavior in their natural habitat with interesting and informative text passages about all aspects of ant’s life. It addresses to professionals as well as to the public, and both groups can use this book to their own needs. Especially inexperienced readers will learn many exciting facts about ants. The authors thereby manage to include new findings and in part even detailed results (see e.g. the information on chemical communication), so also the more experienced readers find numerous passages of interest. The authors thereby manage to keep a very “fresh” tone, what makes the book very easy to read and understandable. Sometimes we would have wished more literature citations, as some interesting aspects are referenced only by “pers. obs.”, but this is something that could be easily corrected in a second edition of this book. The book itself comprises of two parts, a more general first part about the biology of ants and a second part about the identification of selected species. The first part covers almost all parts of relevant fields of ant biology, from life histories over development, division of labor, to mutualisms, trophic niches and different species’ ways of living. The selection of species in the second part focuses primarily on the most abundant species of India, but some rare and especially interesting species are included as well. A short key leads to the identification of the subfamilies, where the different species can be selected by excellent photographs from the field and a short description of the ant species and aspects of their behavior. 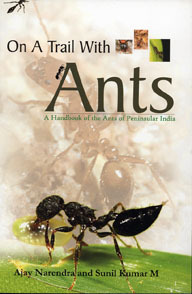 Fifty of the about 600 Indian ant species are presented in this section of the book. One handicap, however, has to be designated when talking about this impressing book: it has no ISDN number and it is only available through the authors (at antbook.india[at]gmail.com). To sum it up, we think this book is a great contribution to myrmecology in India and abroad, and everyone interested in ants should have this book, especially when going to India. Congratulations to the authors! © 2008. Martin Pfeiffer. University of Ulm.